We are very pleased to announce the release of our long awaited Bioretention Inspection App! 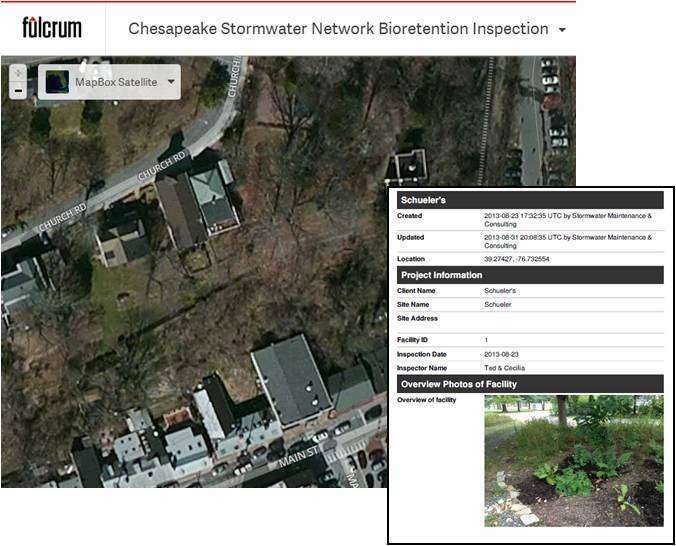 Developed for us by our partners at Stormwater Maintenance & Consulting, this smartphone or tablet based app follows the approach of our Bioretention Illustrated guide and allows users to conduct rapid inspections of individual bioretention practices in the field. The app takes the user step by step through each of the visual indicators prompts the user to ‘rate’ each indicator (per the guidance in the technical guide) and upload photos to document each of the indicators. Finally, the app generates a pdf report of the inspection complete with photos and creates a punch-list of maintenance activities needed to be done in order to bring the practice up to speed. Currently the app has only been developed for the bioretention practice but it is considered “open source” and can be adapted to meet individual needs. This will bring you to the back-end of the app, click save and exit. When you go to your app gallery you will see it there. IMPORTANT: YOU MUST CONNECT THE APP TO YOUR ACCOUNT THROUGH A PC. THIS CANNOT BE DONE FROM YOUR MOBILE DEVICE ALONE. If the app has been downloaded to a mobile device such as a smartphone or tablet you will now see the Bioretention Illustrated app there. Stay tuned to this page for more “apps” we will be featuring that will help you in your stormwater profession. You can read more about using the Bioretention Illustrated app on Stormwater Pollution Management with Fulcrum.